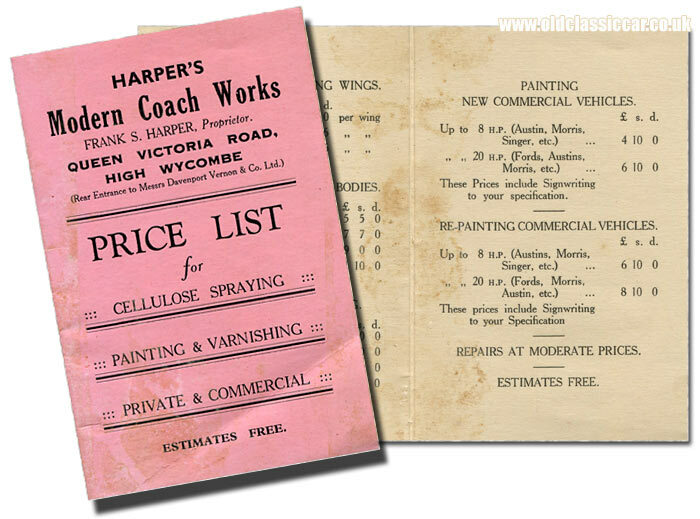 Harper's Coach Works - car paintwork repair in the 1930s. Homepage. This page: A pocket-sized guide to the cost of motor paintwork repairs at a 1930's establishment. As the take-up of motoring increased rapidly during the early 20th Century, so too did the industry to support the activities of these pioneer motorists. Firms large and not-so-large sprung up in towns, villages and cities, all eyeing a slice of this growing market. Some started out in business perhaps as wheelwrights or blacksmiths, cycle engineers or retailers, before diversifying to meet the needs of the motor-car and their owner(s), while others started their businesses afresh, vying with other entrepreneurs in their locality for trade. This tiny booklet was issued by Harper's Modern Coach Works, a business operated by a Frank S. Harper, from premises on Queen Victoria Road in High Wycombe, accessible via the "rear entrance to Messrs Davenport Vernon & Co. Ltd). It describes their schedule of prices for cellulose spraying, repairs to paintwork, and varnishing, for both private motor-car and commercial vehicles like. The publication isn't dated, but must be from the late 1920s, or early/mid-1930s. Given that a voluntary driving test was only introduced in England during 1935 (made compulsory later that year), the need for repair to motor vehicle bodywork, after collisions with other cars, pedestrians, horses and other solid objects, must have been considerable. This business, added to that for commercial vehicle re-painting, and signwriting, must have led to a steady stream of customers to companies such as Frank Harper's. The prices given in this booklet are based on the RAC Horsepower rating of a given vehicle. Re-cellulosing a wing for example, would have cost six shillings - or thirty pence in modern money - for a typical 8hp car (say a Ford Model Y), while those on a 15hp machine would have cost seven shillings and sixpence a corner. Owners of larger cars, over 15hp, would need to pay eight shillings and sixpence for the same work. No VAT in those days! To re-finish a complete body obviously cost a lot more. The Ford Model Y, and others of its ilk, would command a price of £4 10s 0d for a complete re-spray. The 15hp motor-car owner would have to find £6 10s 0d to have their car re-painted, while more commodious motors would have cost £8 10s 0d. Touch-up work and localised re-varnishing would cost from £1 10s 0d upwards. Harper's would be more than happy to quote for the painting of a brand new light commercial vehicle, many of which were supplied in primer only, for their new owners to then arrange a final topcoat. Small vans, from the likes of Austin, Morris or Ford, would cost in the region of £4 10s 0d to paint, while those up to 20hp in rating would require £6 10s 0d for the same job. Interestingly these prices included signwriting to the customer's specification. Given how varied signwriting can be, from simple text through to ornate artwork, these prices must have only been a loose guide surely. Re-painting identical vehicles would require more preparation work, and the costs of such work were typically £2 over and above those quoted for the painting of a new vehicle. The reference to Davenport Vernon & Company Ltd is interesting, as this firm was an ironmongery in the early 1900s, and later turned to garage work. During WW2 the company, from an address on High Street in High Wycombe, was employed in the repair of damaged RAF aircraft, including Wellington bombers. Information on Harper's Modern Coach Works though is less easy to find, although maybe someone familiar with this area - Queen Victoria Road in High Wycombe - may have details?